Best Slip-on Mufflers for Harley Touring Reviews: Top-5 in April 2019! You might think that exhaust is just an exhaust, and maybe there are performance or stock grade exhausts, but you are wrong in thinking so. The motorbike world has two different exhaust types. There are the standard factory exhausts that can be replaced completely and then there are the slip-on systems or muffler replacers that just replace the muffler but retain the original exhaust system. So, as you can see, there are many different options to choose from that range from a standard stock exhaust, with a replacement muffler to a complete change from a factory system to a performance kit upgrade. The slip-on muffler replacement kits “slip-on” to the head pipe, and this means that you don’t get an upgrade (or only slight) in performance while you do get a change in sound. The best slip-on mufflers will create exceptional tones and will have the best chrome or black finish to complement the stock or other upgrade parts on your ride. Budget issues are usually the main reason for a slip-on change, where these products are fundamentally cheaper than a full change, and extremely popular when not requiring a performance upgrade. A such, you do have to consider what your future goals are when making incremental changes to your bk to meet budget restrictions. There are also modular systems that take into account the budget constraints of the rider, and provide you with a slip-on that can later be upgraded into a full change. When you want to consider a modular change that allows you to upgrade over time and in step with your budget, check the brand and the type to make sure it fits the future requirements. In this article, I present you with the five best mufflers for Harley touring applications. This is the Demons Cycle 3.5 slip-on muffler for 1995 -2013 FLHR, FLHRC, FLHRS, FLHTCU, FLTR, FLHX models. 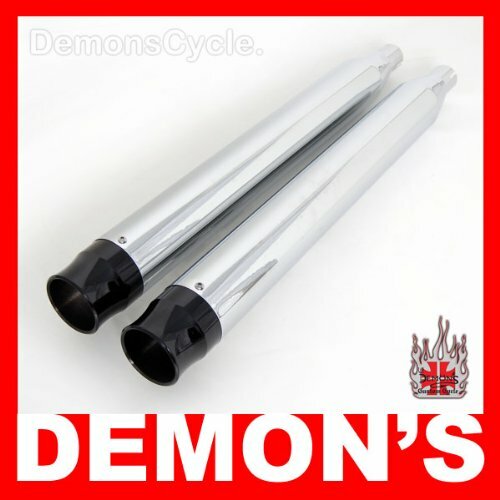 The Demons Cycle 3” slip-on muffler replacement kit comes with a chrome finish and Black Barrel Billet Aluminum Tips. The muffler is made from a triple chrome plated steel and delivers a steady, tough, low rumble which comes from the venturi chamber design baffle. The 1-3/4″ inlets on this baffle enable compatibility to the OEM headers and deliver slight performance upgrades, and comes with an internal heat shield. The overall length of this model is 32,” and it has a large 2-3/4″ outlet on 3″ mufflers finished off with a chrome billet tip. If you are seeking a budget-friendly slip-on system, then this is the deal you are seeking. 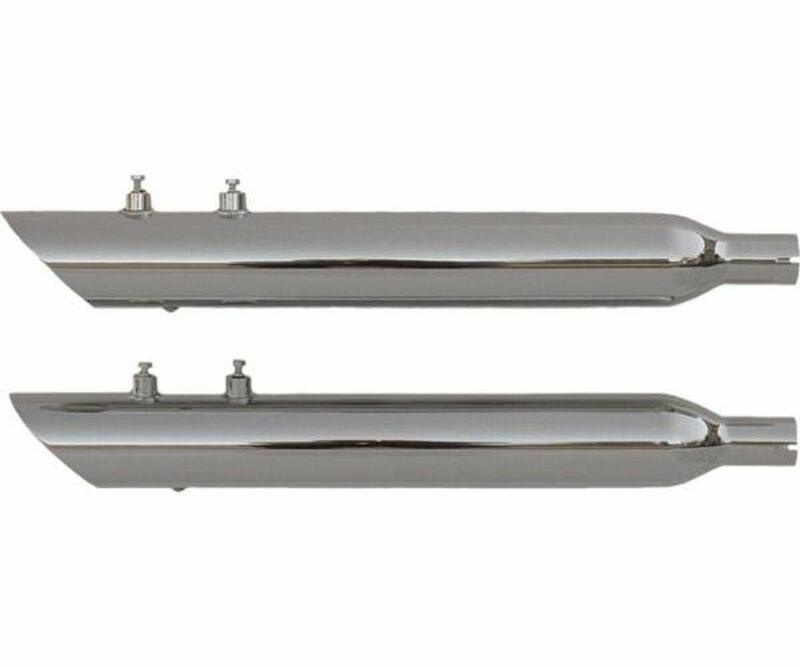 These are classic no-nonsense chromed muffler slip ns that come at a very impressive low-cost price from a popular aftermarket brand. 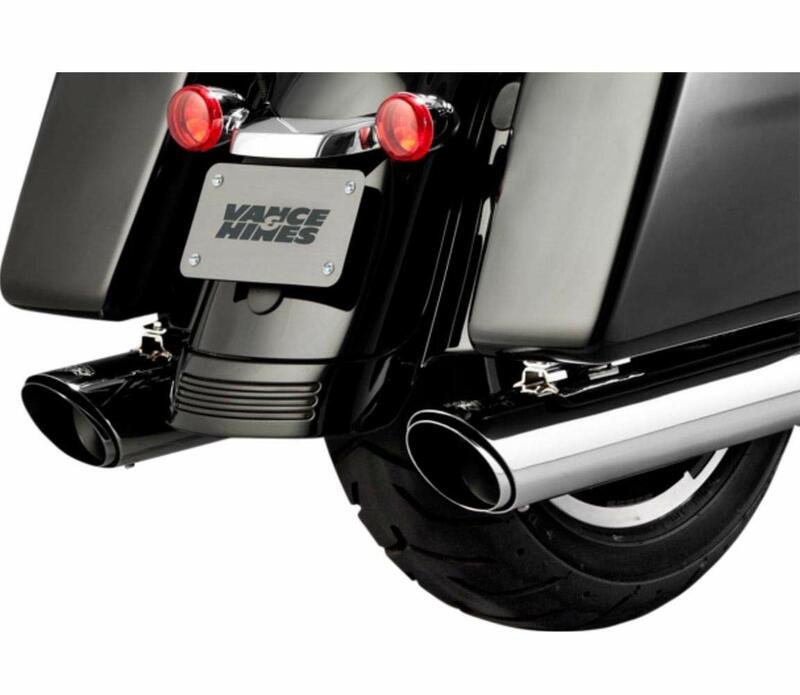 Vance and Hines are a leading force in the aftermarket parts scene, especially for Harley Davidson models. This model fits a large range of Touring models and as a slip-on is a leading high grade and exclusive component. In other words, it’s expensive. The reason its priced the way it is is due to the special design features that include twin slash ends with large 4” muffler bodies. The new chrome polished finish design reduces bluing and provides a slight upgrade in power and torque with a virtually maintenance-free performance. These are the Rounds Monsters, which are the round version of the Monsters Ovals, and you get to hear your engine’s performance in stereo. If its looks and sound, and you are ready to dish out the moolah, then go for it, you won’t regret this buy, and since it’s a V&H model you get to add to it when you want to make a complete upgrade at a later date. This is the Rush Racing® 3” Slip-On Mufflers with Chrome 1.75″ Baffle, modular kit component. Rush Racing is a performance perfectionist that constantly churns out amazing upgrades. This is their modular muffler slip-on that comes with a hefty price but delivers where performance is required. This part fits all 2004-2015 models, and withstands 300oF of heat as well as provides an immediate increase in power of an additional 5HP. This model comes with dual layers of ceramic thermal protection, there is a coat on the outside and the inside that provides excellent heat resistance and delivers an overall smoother and cooler ride. You can actually get a black finished version instead of the chrome one, and both versions deliver the same deep-throated growl. This model comes with a number of variations, so you can fit it to just about very HD there is. This is a top-level slip-on and delivers additional power which is a great advantage when just buying a performance grade slip-on muffler unit. This is well worth the money if you are seeking improvements in performance as well as in looks. This is the Rush Racing® 32001-250Big Louie™ Mufflers for various 1998-2009 applications. This is the more popular Rush upgrade kit for slip-on exhaust systems and is a chrome plated slash down 2.50” baffle model. This is a dyno tested part and comes with special features that are unique to this product. These features include a special insulation mat that is engineered to disperse heat and retain sound. The outer shell is chrome polished to perfection, and the insulation makes sure that there is no blueing. If you buy the black finish, then there is definitely no blueing. This model delivers an exceptionally deep throaty tone, which is the iconic Big Louie sound that many have come to associate with all Harley rides. In addition to an impressive sound, there is an additional 5HP added on to your engine’s performance, and as such, you get more kick own power from one simple upgrade. The insulators also protect your legs from the heat, and the overall exhaust temperatures are reduced further in this unique application. This is one of the kings of the aftermarket slip-on scene, and is priced for royalty. If you have one of these on your bike you will be heard before you are definitely noticed. Yup, you read this right, this is only for the latest Touring models, the 2017-2018 variants. 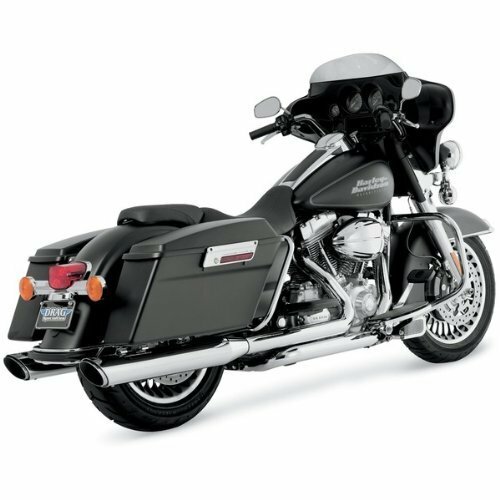 This is a twin slash model that comes with the classic Rounds muffler body and the 2-into-1 design that is featured on 10 Road Glide and Street Glide models. The baffle is an all-mechanical straight through louver, and it starts out at 4” and steps up to 4.5” and is designed to minimize heat discoloration (bluing). Consider the fact that this is bespoke for only 2017 to 2018 models and you realize how special and focused these slip-on mufflers are. As such, if you are only seeking a muffler change to your new Harley, this is the one you must have. This is a classic slip-on model that comes with exceptional design features. It is on this top five list because its price-performance ratio is sky high. This is a winner and you pay for exceptional performance.